My mom gave me this recipe, not sure where she found it. It has become one of our favorites. 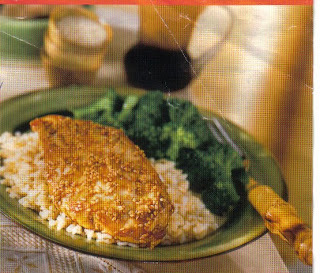 I often make it using diced chicken, and I serve it with steamed broccoli and rice. It's a keeper! Place a large nonstick skillet over medium-high heat until hot. Add sesame seeds, and cook, stirring constantly, 1 to 2 minutes or until seeds are toasted. Remove seeds, and set aside. Place chicken breast halves between two sheets of heavy-duty plastic wrap, and flatten to 1/4-inch thickness, using a meat mallet or rolling pin. Coat skillet with cooking spray; place over medium-high heat until hot. Add chicken, and cook 3 minutes on each side, or until chicken is lightly browned. While chicken cooks, combine toasted sesame seeds, honey, soy sauce, and ginger. After chicken browns, add sesame seed mixture to skillet, and cook 3 additional minutes, turning chicken to coat with sauce. Serve sauce over chicken. I usually double the sauce because we like a little extra on the rice. My whole family loves this meal... and since I usually keep diced chicken in the freezer (I buy 20 lbs. or more when there's a great sale, dice it up and freeze in 1 lb. portions in freezer bags)... I can make this in about 20 minutes. Start the rice first... and all is done at the same time. Simple.